I have arrived late to the whole parenting blogging scene, probably around 10 years too late. But I don’t really mind, as I started to blog to keep my brain busy between trips to the playground and trying to feed my picky eater. So I started to write about our travels with our little son, share my favourite vegetarian recipes and review some products. I also thought, since I might need to abandon my profession (pre pregnancy I worked for hotels as a revenue manager) as I won’t be able to fit it around the children, might as well try to learn new skills, make some extra money and use it as a reference when I’m ready to return to the professional world. The more I’ve learned, the clearer it became, that nowadays, producing quality articles is just simply not enough. Meaning, if you decide to monetise your blog, being a good writer with an interesting perspective isn’t enough. Bots can write blog articles. 1. Social media is everything. I’m getting so much more interactions through my social media outlets, than through my blog. Also, sharing not only MY blog posts, but interesting articles from other bloggers which I liked, some lighthearted videos for a good laugh and news about things I care about – several times a day – is very important. So is interacting with my followers. 3. Signing up for newsletters are overrated. Just don’t push them on your readers. Did you sign up for something because of an annoying pop up saying to do so? No, me neither. Well, that’s what I think. I don’t follow any blog and I have very few followers. But I do read a lot of blog articles – just not every article of a single blogger. I already receive so many emails on a daily basis (and delete without opening them) , I don’t want more. 4. Niche stands out. This is not news. Since all the top places are taken in general parental blogging. Scarymommy, anyone? She (khm, the content writers) mainly shares other bloggers’ posts and lots of funny and emotionally moving articles and motivational qoutes. It’s a great site, I read it when I come across something, but I miss the personal touch. To make decent numbers (not big ones) you really have to stand out, in my opinion. Which means, you have to provide something which is not necessarily for everyone. 5. People want personal stuff. You have to be really personal and you have to let the whole world into your life. I’m not sure if I want that. I prefer blogs with a strong, personal voice in a niche, which interests me. (Like living eco friendly as a family. Interesting vegetarian recipes – kept short. Just post the ingredients and a photo of the dish for me please.) But, at the same time, I don’t want to dive deep into other people’s life. I enjoy reading a well penned, emotionally moving read, but I find that, lots of bloggers only produce (sometimes meaningless) personal contents to keep up with the trend and produce 4-5 articles a week. Sort of “to my son, on your 2.7 birthday” if you know what I mean. Maybe that’s why I’m never going to be a successful blogger. I feel that, it’s cheating. But, maybe i’m wrong, and that’s what other people really want to read about. THE FUTURE: Vlogging is the new blogging. (With YouTube already have lost its kingdom, as all social media platfors provide a tool for that too.) Is it because you can absorb information faster? More information? Is it because we’re getting lazy? Reading takes more time and effort? Is it down to the digital generation? I don’t know. 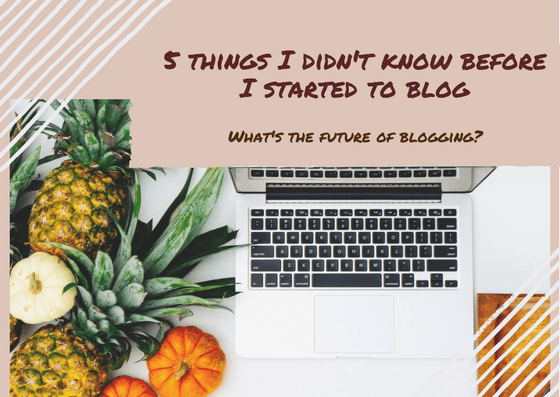 But many bloggers started to successfully merge blogging and vlogging. I see more people starting blogs too. To express themselves, to fight loneliness, to share knowledge. And that’s great, blogging helps making new friendships, learn new skills, sell skills and products, influence others and more. But it will be harder and harder to grow as Google puts little blogs against the big brands, so it is increasingly hard to reach decent authority. On the other hand, lots of blogs are not getting too much traffic from Google anyway (because they engage well on social media), so it doesn’t really matter in the end. As for me, I would probably never venture into the vlogging fields. I never watch videos, they annoy me – especially the automatically playing ones on Facebook. Let me decide if I want to watch this please. You should, some people are so unexpectedly natural and original when it comes to vlogging. Not me! #HumpDayLinky Your article is very interesting as it demonstrates how we all blog for very different reasons. I have only been at it for a year and I just love the interaction with other bloggers, as well as the writing. I am a bit addicted! I agree, vlogging would not be for me, I just love to write too much. I can’t imagine ever becoming a commercial site as I don’t think my content is ‘niche’ but I would love to be able to earn an income from my newfound passion. I love writing too, but I haven’t got too much time on my hands. So it’s very hard to the balance. Sometimes that means quantity over quality. But taking a different approach lately. Social media is definitely the key, and like you I have no interest in vlogging, mainly because the whole idea of appearing on camera terrifies me! Yes, that’s the most enjoyable part of it, isn’t it ? So true. I think readers LOVE the personal stuff. If it’s too vanilla or too ‘transparently marketed’ readers will skip it!